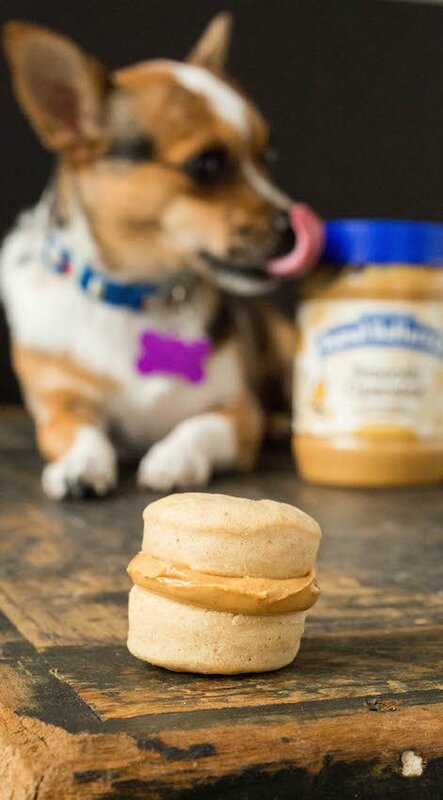 Learn how to make homemade Peanut Butter Macarons for your dog with this easy to follow recipe. Be sure to watch the recipe video at the end! *The peanut butter for this post was provided by Peanut Butter & Co. I just want to come clean and admit to something before we go on with this post: I am one of those people who loves their dog like a child. You think it’ll never be you then BAM, one day you’re looking at the camera roll on your phone and it’s just thousands of photos of your dog sleeping and posing in bad selfies with you. I don’t mind it though. These days I’m embracing it. The last treats we made for Pearl turned out to be one of the all-time most popular posts on our blog. Guess we’re not the only ones who love to spoil our dog! 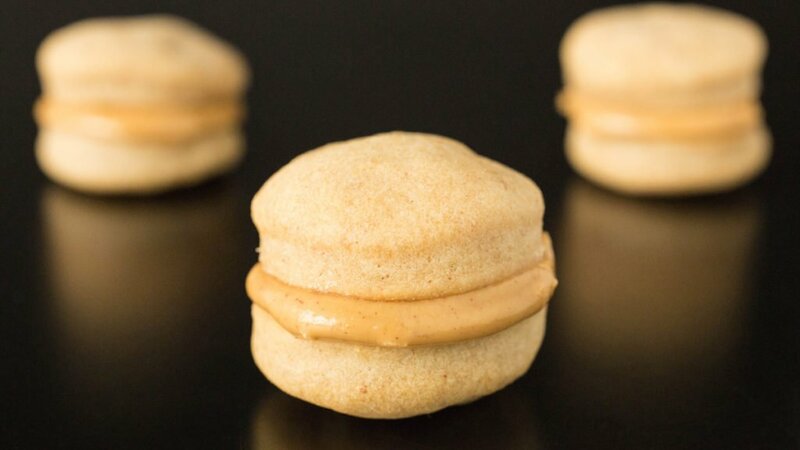 This time we decided to take dog treats to a whole ‘nother level by making peanut butter macarons. 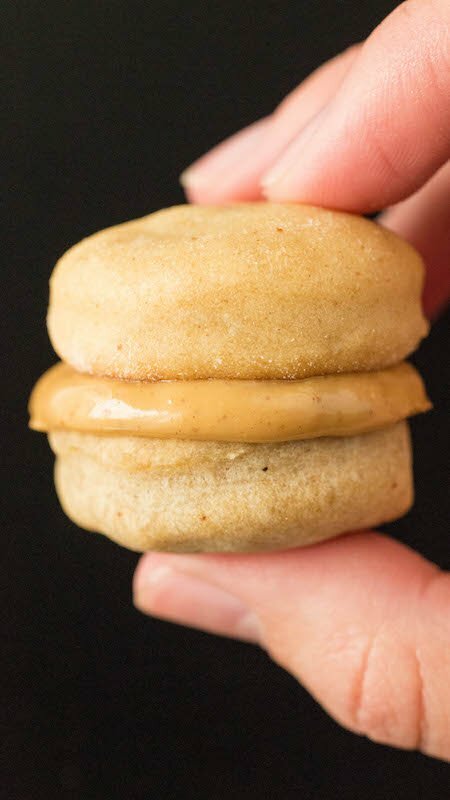 Peanut butter is one of Pearl’s most favorite things on the planet, so how could she not love peanut butter sandwiched between two peanut butter cookies?!? Dog heaven! You may know by now that some brands of peanut butter are using xylitol as an ingredient. 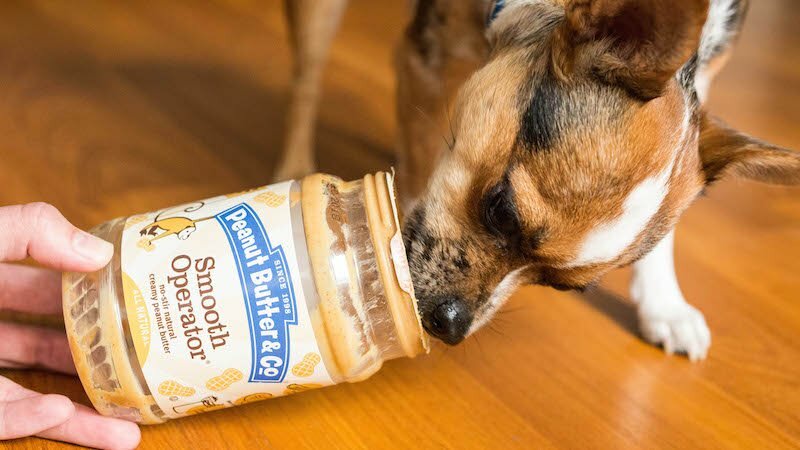 Xylitol is toxic to dogs, so please be sure the peanut butter you are using does not include it. We like to use Peanut Butter & Co. Not only is it free of xylitol, but it is also made from all natural ingredients. Pearl seems to like it a whole lot too! Whether you make these dog treat macarons for your pup on a special occasion, or just because we hope they enjoy! In the bowl of your stand mixer (or another large bowl if mixing by hand), add flour, baking powder, peanut butter, egg, honey, and milk. Beat until ingredients are well combined and a soft dough forms. Give the surface you are going to pat the dough out on a light dusting of flour. Pat the dough out into a rectangle 1/2″ deep. Use a small cookie cutter (I used this one) to cut out circles of dough. Place them on a parchment-lined baking sheet and bake for 10-15 minutes. When ready to give to your dog, put some peanut butter in between two cookies. To store, place cookies in an airtight container or Ziploc bag and keep in fridge. HAHAHA…well I don’t have a dog, but this sounds like a great idea. Homemade treats for you pets is a great idea!! Homemade treats for your pets are always a good idea! We sometimes “babysit” my step daughter’s dog and I like to bake peanut butter dog treats for her. Next time she’s here I’ll make sure to try these beautiful macarons! P.s. Pearl is adorable 🙂 . Super cute idea! I LOVE you video! I’m going to share this with all my dog lovers! We dont have a dog but this is a great recipe to share with my friends! These are too cute! What a great idea for dog treats. Plus, that peanut butter is pretty amazing. It’s my favorite brand. I can totally relate to treating your pet as one of your children. The hubby I am don’t have human kiddos. . .so our pets are very much so our children. That means they get spoiled rotten. 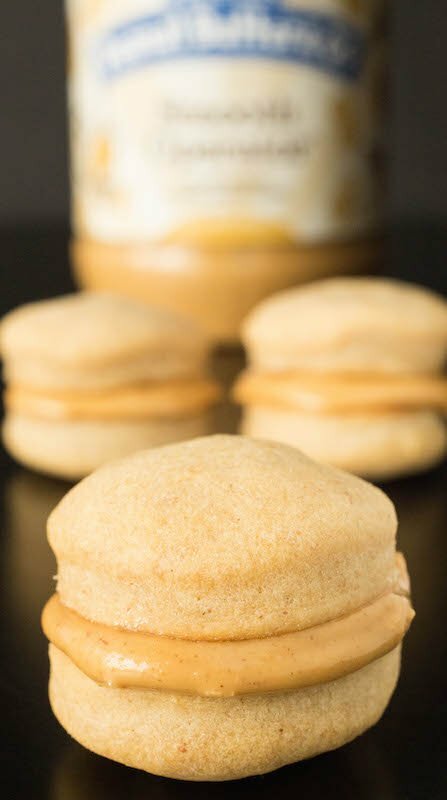 I haven’t actually made them homemade treats myself. . .I guess because there is a great pet boutique down the street from us that sells homemade treats. . .but boy do these peanut butter macarons look tasty. And what dog doesn’t like peanut butter? I don’t have a dog, but I would eat these in a heartbeat! My attempt at this turned out awful :(. These are so cute but it was impossible to deal with the dough, it was intensely sticky. I even let it sit in the fridge for an hour to make it harder so I could cut it, but it was not having it. I don’t know what I did wrong. Chelsea, I’m so sorry you had a difficult time with the dough. Anytime you have dough that is too sticky, you should add more flour. The measured ingredients in this recipe usually work out perfectly for me, but variables such as humidity and measuring techniques may require you to add a little more flour. I will add this to the recipe notes in case someone else encounters the same issue. If my pups are allergic to eggs could I use applesauce in this? Also would almond or coconut flour be okay? Thanks! !